Also serving communities of Elmwood. The average cost of assisted living in Menomonie is $3,687 per month. This is higher than the national median of $3,346. Cheaper nearby regions include Chippewa Falls with an average starting cost of $3,687. To help you with your search, browse the 1 review below for assisted living facilities in Menomonie. On average, consumers rate assisted living in Menomonie 4.0 out of 5 stars. Better rated regions include Eau Claire with an average rating of 4.4 out of 5 stars. Caring.com has helped thousands of families find high-quality senior care. To speak with one of our Family Advisors about assisted living options and costs in Menomonie, call (855) 863-8283. Menomonie, which is nationally recognized for its historic Main Street, is a traditional city in western Wisconsin. Over 16,000 people live in Menomonie, and about 12 percent of them are seniors. The area’s seniors are served by five assisted living facilities, with four located within Menomonie city limits. Wisconsin’s assisted living facilities, including those in Menomonie, are designated as community-based residential facilities (CBRFs) and are home to five or more seniors. These facilities are licensed by the Wisconsin Department of Health Services. The Eau Claire-Menomonie metropolitan area has some of the cleanest air in the country. In two air quality categories (ozone and 24-hour particle pollution), the area is tied for first place. Seniors with respiratory conditions, like asthma or COPD, may find they breathe more easily in Menomonie. Menomonie’s overall cost of living is 9.6 percent lower than the U.S. average, mainly due to lower housing costs. However, some budget categories, including health care, are more expensive than the norm. Menomonie has property and violent crime rates that are greater than 92 percent of the communities in Wisconsin. The major contributor to the city’s crime rate is property crime, which affects one in 36 people. The community’s public transit options include a fixed route bus service operated by the Dunn County Transit Commission. Reduced fares are available for seniors who can also schedule rides on The Doorstop Bus, a door-to-door bus service. The Menomonie area is home to world-class medical facilities, including Mayo Clinic Health System - Red Cedar, in the event of medical emergencies or illnesses. 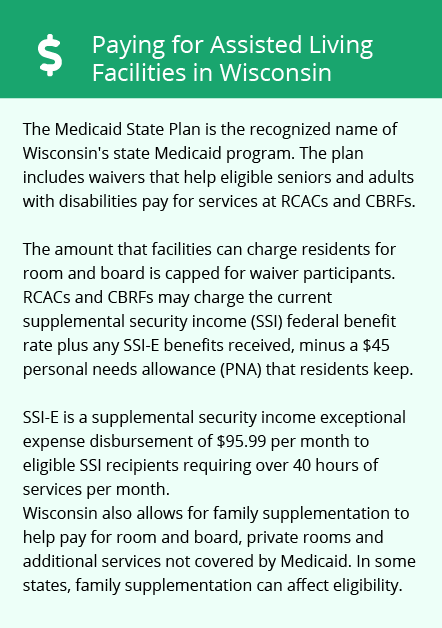 Wisconsin doesn’t charge state income tax on Social Security benefits. Many types of pension income, including military pensions, are also exempt. Seniors may choose to retire in Menomonie to take advantage of these retiree-friendly tax policies. Assisted Living costs in Menomonie start around $3,687 per month on average, while the nationwide average cost of assisted living is $4,000 per month, according to the latest figures from Genworth’s Cost of Care Survey. It’s important to note that assisted living rates in Menomonie and the surrounding suburbs can vary widely based on factors such as location, the level of care needed, apartment size and the types of amenities offered at each community. 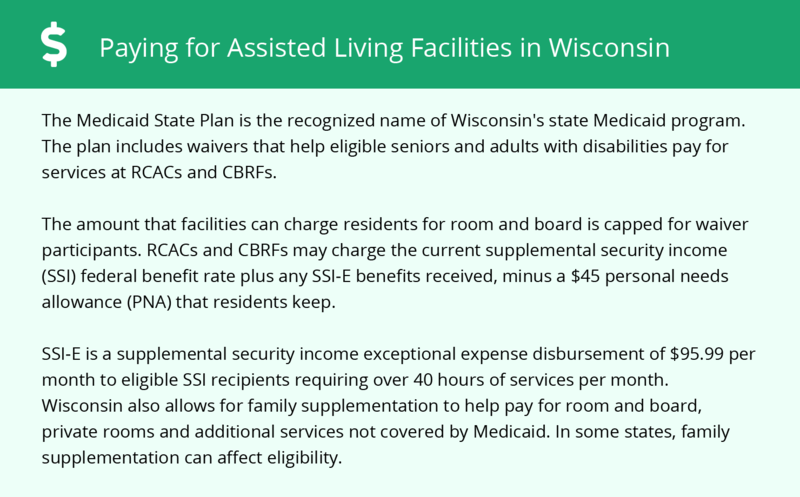 The state of Wisconsin provides financial support to Menomonie seniors through its Elderly and Physically Disabled Waiver program. Some seniors may also be able to receive a Supplemental Security Income (SSI) exceptional expense payment, which they can use to help pay for assisted living costs. Menomonie and the surrounding area are home to numerous government agencies and non-profit organizations offering help for seniors searching for or currently residing in an assisted living community. These organizations can also provide assistance in a number of other eldercare services such as geriatric care management, elder law advice, estate planning, finding home care and health and wellness programs. To see a list of free assisted living resources in Menomonie, please visit our Assisted Living in Wisconsin page. Menomonie-area assisted living communities must adhere to the comprehensive set of state laws and regulations that all assisted living communities in Wisconsin are required to follow. Visit our Assisted Living in Wisconsin page for more information about these laws.